Each page of this book is filled with gems of wisdom that illuminate the path towards discovering greater joy and peace within oneself through the teachings of the Buddha. Without feeling overly technical or onerous, Losang''s friendly storytelling nature draws the reader into a delightful journey through the complexities of Buddhism and spirituality for everyday life, all the while preserving the profound essence of the teaching. He masterfully weaves together the story of how the teachings of the Buddha can help anyone of any culture or faith achieve greater peace and joy by practicing loving-kindness and compassion. He affirms the potential that lies within each of us to realize the Buddha within and to become free from suffering through the wisdom that lies within these Ancient Teachings in Modern Times. When I first sat down to write I was only planning to draft a few pages to share at retreats in the United States and Canada. I am amazed that this simple idea developed into this lovely book that offers the essence of the teachings of the Buddha relevant to everyday life in the 21st century. Writing this book is a wonderful opportunity to share what I have learned from growing up in a Buddhist family, studying for 20 years in a monastery, and living for over 20 years and teaching in the West. I feel that this book is special, because it shares a unique perspective resulting from the diverse experiences I have had and is inspired by the wonderful people I have met. When I travel to create sacred sand mandalas, it is wonderful how children, adults and elders share their joy and questions about spirituality with me. It is incredible how similar their delight and concerns are, regardless of the religious or spiritual tradition they may follow. I feel fortunate that I have the chance to meet so many wonderful people who are all unique and special. Through this book I hope that everyone comes to see themselves as unique and special, and to recognize the beauty and gifts that we all possess. Please use the drop-down menu to specify shipping. 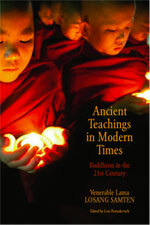 For shipping to all other locations, please contact Losang directly: losang_samten@yahoo.com. You can go here to listen to an interview with Losang on Sante Fe Radio Cafe. The interviewer is Mary-Charlotte and it was recorded on Wednesday, Dec. 21, 2011. Scroll down to the 21st for Losang's interview. Enjoy!